Towne Lake Dental Implant Restorations: Say Goodbye to Gaps! 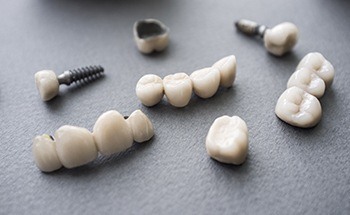 Missing teeth are a problem faced by over 100 million Americans every day, but thanks to dental implants, patients can now get a restoration that is virtually indistinguishable from nature. Dental implants are the only treatment that replaces a tooth both above and below the gum line, creating the most lifelike results possible. At Dream Dental, Dr. Haren Patel works with a team of trusted local oral surgeons to provide this treatment right here in Woodstock. 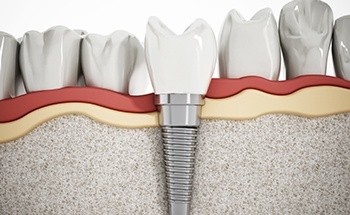 A dental implant is actually a small titanium post that is used to replace the root structure of a lost tooth. After one is placed into the jaw via a minor surgery, it can be attached to a variety of restorations to replace any number of missing teeth (more on this below). Dentists from all over the world agree that dental implants are the most complete tooth replacement solution available today. Not only do they create an extremely strong foundation for the new teeth, but they also help prevent the bone loss that is so common after tooth loss. They also last for an extremely long time—up to 30 years with the proper maintenance (which only involves consistent brushing, flossing, and dental checkups!). Dental implants can reliably replace a single tooth, an entire mouthful, and everything in between. 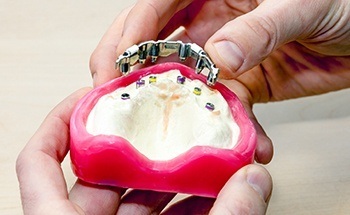 Implant-retained crowns can make a single gap disappear, while an implant-retained bridge can fill in the space left by a few missing teeth in a row. Multiple implants can even be used to support a denture that has a much stronger and more consistent hold than a typical removable prosthetic. In short, if you’re looking to rebuild your smile for a lifetime, dental implants are the way to do it, and you can get them with Dr. Patel and Dream Dental. To learn more about them and schedule a consultation, contact us today.